Sojourn will be pouring our stunning 96 point Pinot noir at two spectacular events in PA in May! 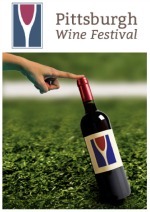 First up, Pittsburgh Wine Festival on Thursday, May 8th from 5-9pm at Heinz Field. Come and celebrate the kick-off of the Pittsburgh Wine Festival’s 12th year with us. There will be 500 different wines of every varietal and terroir. The VIP Tasting is from 5-7pm with the Grand Tasting following from 7-9pm. Next up is the Philadephia Wine + Food Festival on Saturday May 10th from 5-9pm at the Simone Foundation Automotive Museum. There will be over 600 samplings of exclusive wines from around the world, cuisine from Philadelphia’s most popular restaurants, an on site fine wine and spirits store and a silent auction benefiting the Children’s Hospital. Join us for a whirlwind of exquisite wine and incredible food. Don’t forget to ask about our special "under the table" wines.